It’s no secret that more than ever, thieves are getting more clever. As safety technologies evolve, so do ways criminals steal from you. One of the biggest purchases you can make in your life, outside of a home, is a vehicle. That’s why it’s important to understand new ways criminals are using technologies to steal them. What thieves are now doing is they are using a “relay attack” to break into cars. Basically what this “relay attack” does is it hijacks the signal from a person’s key fob which allows them to open a car without the alarm going off. It also in many cases lets them start the car without having to have the actual keys in their possession. But how exactly do the thieves get close enough to your keys to steal the signal? It’s pretty easy actually. They often works in teams of two or more. One will get close to victim, and the other will be close to their car. That way when the “hacking” device that’s near the victim who has the keys in their possession, it sends a signal to the other device near the car, unlocking it. Then they enter and use the same signal to start the car. And they’re off, and when you get back to your parking spot your confusion soon turns to anger and a sick feeling in your stomach. However, this type of criminal activity can be stopped quite easily, and very inexpensively. 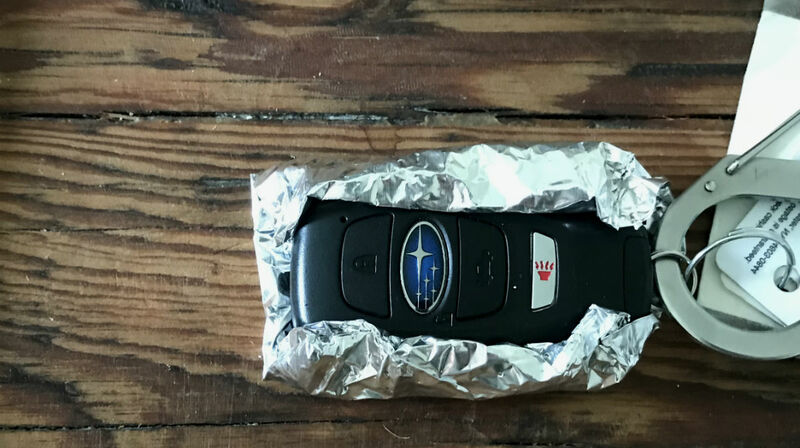 What many people are doing is they are wrapping their keys in tin foil to block the signals from being able to be hijacked. While this is a great way to stop thieves from stealing your car during the day, while you are out and about, it’s quite annoying to keep having to re-wrap them in foil. Since criminals are getting more and more brave, stealing cars from driveways, both during the day and at night, there’s an easier way to protect yourself while at home or sleeping. Simply place your keys in an old coffee can. This acts in the same way the foil does, it blocks the signal from being able to be stolen. If you don’t have an old tin can laying around you can also keep your key fob in a microwave, fridge, or the freezer. All of these will do the trick.